By the time Friday evening (well, truth be told, Friday afternoon) comes around, it feels like it's time for a cocktail. Sometimes the mood swings to following a recipe, either strictly or loosely, and sometimes it'll be total free-form. This cocktail started as a riff on a Negroni, but the excitement of returning from London with a bottle of Braulio Amaro Alpino turned it into an even more bitter-focused, herbal-tinged cocktail. 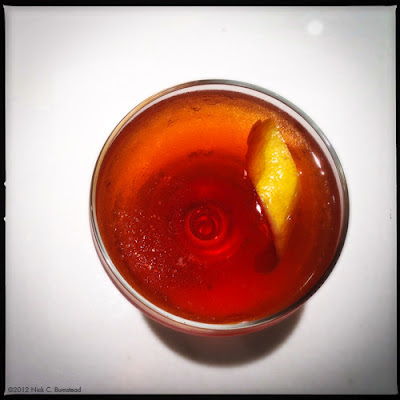 The elements of a Negroni are still there, but maybe this is a more Fall version. Definitely, bitter, but balanced and clean. 1) Combine ingredients in a mixing glass and add ice. 2) Stir until well chilled. 3) Strain into a chilled coupe or cocktail glass. 4) Garnish with a lemon twist.